Much has been said about the grand arrival of Melissa Benoist as Kara Zor-El, but what about her surrounding players? 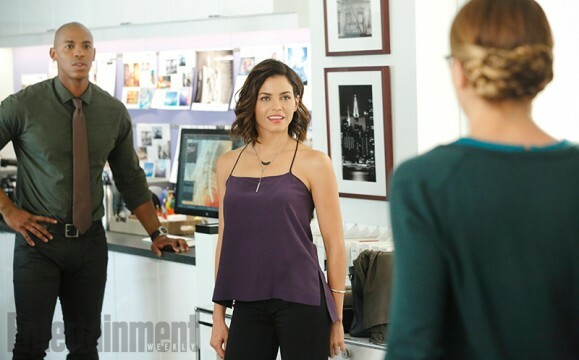 With CBS continually expanding the roster of characters in Supergirl, the network is now beginning to spotlight some of the show’s supporting team, and today brings a fresh batch of information – and first still – for Jenna Dewan-Tatum’s Lucy Lane. While she initially comes between Kara and her love interest, James, Executive Producer Ali Adler reveals that Lucy Lane’s role in Supergirl develops throughout the course of the maiden season, even hinting that the pair strike up a friendship as the episodes go on. In an interview with Entertainment Weekly, Adler touched upon the nature of the character, and how the writing team are setting out to portray a character that is both loyal to the DC source material and one who can stand on her own as a memorable screen presence. Lucy will only be exposed to one half of Kara, of course, given that she is a pencil pusher by day, city saver by night. Having kept her supernatural powers under wraps for little more than a decade, our titular heroine learns to embrace her powers in order to bring good to the denizens of National City. But it isn’t long before the cousin of the Man of Steel begins to attract nefarious forces to her beloved metropolis. Melissa Benoist will take flight as the title character when CBS’ Supergirl series has its premiere on Monday, October 26. There it will enjoy an extended pilot episode, before making the jump to its regular slot the following week.